Today we introduce Lisa Amstutz, author of more than 80 children's books, most of them nonfiction. 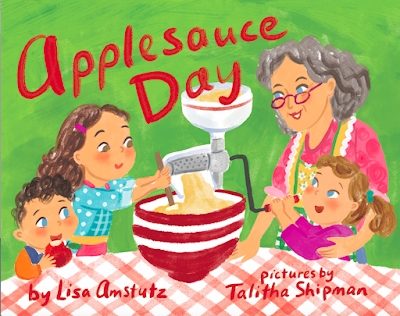 Be sure to enter to win a copy of her recent book, APPLESAUCE DAY!, illustrated by Talitha Shipman (Albert Whitman & Co.). I’ve always been a bookworm, but writing for publication never crossed my mind until after my kids came along and I was looking for ways to work from home. It took me years to screw up the courage to start submitting (after reading every book on writing in three local libraries.) And when my first articles came out, I literally could not look at them for days. Getting published was rewarding, though, and I loved the challenge of it. I wrote for adults for a few years, then got interested in writing a kids’ version of an adult book I had co-authored. Somehow I found SCBWI and fell in love with kidlit. I learned about writing for the educational market through an SCBWI event, and then took a class on that topic, which launched my children’s writing career. My background is in science and we live on a small hobby farm, so writing about science and agriculture was a natural fit. Congrats on your recent book, APPLESAUCE DAY! Tell us about it and what inspired you. Thanks! Applesauce Day is fiction based on a longtime family tradition of making applesauce each year. My mom grew up making applesauce with her mother, and passed that tradition on to me and now to my children. We have fun working together each summer to process about three bushels of apples, which is enough to last us the whole year. There is nothing better than fresh, warm applesauce! If you’ve never made applesauce, I hope the book will inspire you to try it and maybe start a family tradition of your own. What is your research process for your books? It depends on the book, really. I often start by reading children’s books and Wikipedia to get an overview of the topic. These sources can’t be cited, but often have links to sources that I can use. Once I understand the topic better, I can target my Google and library searches to find scholarly journal articles, primary news sources, adult science texts, etc. Google Scholar is a great tool, as is WorldCat. I like using Scrivener to organize larger projects and EasyBib to keep all my sources straight. My editor and I are finishing up edits on TODAY WE GO BIRDING, which will be published next fall by Albert Whitman & Company. It is a picture book based on the Christmas Bird Count, an Audubon Society citizen science project. My agent is working on the contract for another project that I hope to announce soon. I’m also writing several picture books for Capstone Press and Rourke Educational Media that will be out next year. What is the hardest part of writing nonfiction for kids? The easiest? One challenge for nonfiction writers is sorting out the story or the critical facts from the mass of information that’s out there. It’s tempting to cram it all in—but sometimes what you leave out is as important as what you put in. The easiest part for me is coming up with ideas – I have more of them jotted in my notebook than I could write in a lifetime. Scientists, archaeologists, and historians are constantly making new discoveries and inventing new technologies, so there’s always plenty of subject matter at hand. What advice would you give to aspiring nonfiction authors? Read lots of new nonfiction—it’s much different from what most of us grew up with. Go to a bookstore and browse the nonfiction section. Consider what makes you pick up a particular book and what makes you keep reading it. What will make your book stand out among all these competing titles? Consider also what will make your book most useful for students and teachers—and don’t forget the back matter. Check Common Core or Next Generation Science Standards to find out when your topic is covered in schools. Believe it or not, there’s an app for that! I lived in Guam for two years when I was a kid. It’s a beautiful island, and living there was an amazing cultural experience. I live in Ohio now, and I love it here, but part of me will always miss the ocean! My website is at www.LisaAmstutz.com. You can sign up for my newsletter there and find information about my editorial services and books. I blog with one of my critique groups at www.songofsixpens.blogspot.com. My Facebook author page is www.Facebook.com/LisaAmstutzBooks, and my Twitter handle is @LJAmstutz. 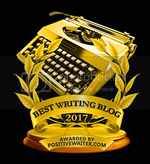 I love to connect with readers and other writers online! 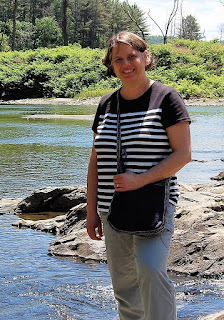 Lisa Amstutz is the author of more than 80 children's books, including Applesauce Day (Albert Whitman & Company, Fall 2017) and Today We Go Birding (Fall 2018). 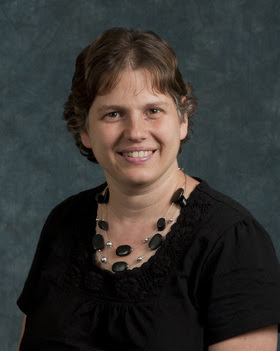 She specializes in topics related to science, nature, and agriculture. 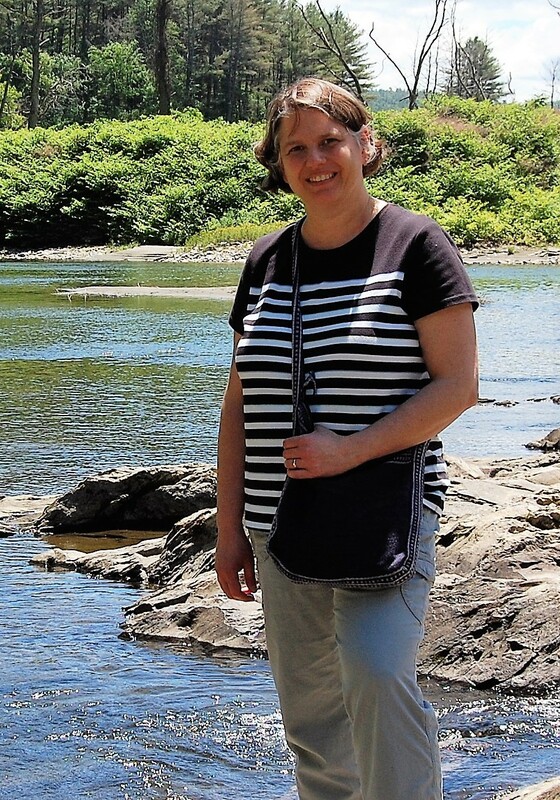 Lisa serves as Assistant Regional Advisor for SCBWI: Ohio North and as a Rate Your Story judge. Her background includes a B.A. in Biology and an M.S. in Environmental Science/Ecology. Lisa and her family live on a hobby farm in rural Ohio. Visit her online at www.LisaAmstutz.com. There's a treasure of good info here! Thanks, Lisa! Such a good topic, where children learn a real skill with a parent and grandparent's influence. These traditions are priceless for the child to feel a connection. It's exciting to see the published version of this book. Lovely illustrations! Thank you for an informative and inspiring post! Coming from a science background, it's encouraging to see how I might turn that into a PB writing career. Thanks for the interview! I LOVED making applesauce as a kid. I think that was the first thing I cooked on my own. I enjoy writing nonfiction--it's like a puzzle putting together pieces in fun, entertaining ways and with few words. Thanks for the interview today. Good information about nonfiction books; thanks for sharing! Thanks to all of you for your kind comments!